People matter. As an HR leader, you find, allocate and keep people so the organization’s short- and long-term goals are met. Solving the talent and innovation challenges for your industry are critical tasks that should top the HR agenda of industry executives. Yet, it is the work and workforce changes you didn’t anticipate or did not see coming that disrupt operations. Looking to the past may solve some of these problems. However, we urge you to also look ahead, because it is what lies ahead that derails leaders, not the past. We know HR leaders need new tools and strategies to be forward looking, preparing you for an uncertain future. We have those tools and have used them for over three decades with clients to help them be prepared, not surprised. The field is called foresight. We consult, train, educate and research futures content for diverse clients across industries. Clients use this information in many ways, though all of them leverage the insight to be better informed, better prepared and ready for change. We want to help you learn about, and use, foresight tools insight, and methods to manage your unknowns, your uncertainties as well as the many opportunities in your work and workforce future. By understanding your own working future better, you can create customized responses to impending work and workforce challenges such as talent shortages, skills gaps, aging workforce complexities and retention of important talent. Looking forward, and using the right tools and evaluative techniques, is insurance against forces of change that can blindside, disrupt and cause panic; the kind of situation that keeps HR leaders up at night. How is this different from strategic planning? Planners often have little to base their projections on beyond what has been tried and what is current thinking. Workforce planning is often only about replacing headcount, hiring new workers to replace those who leave. A futures exploration reveals changes organizations might not otherwise discover. It can help an organization rethink its assumptions about what future workforce skills and knowledge are or will be needed, identify new opportunities and craft better workforce solutions. 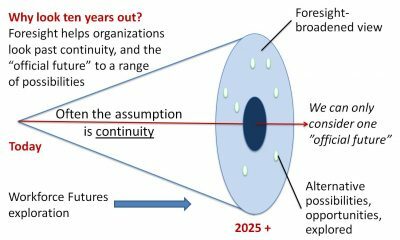 By exploring “what ifs” of the longer-term future, executives are more likely to have early warning of changes and future needs, thus giving them precious lead time to plan, develop and build a workforce for the future. We are a collaborative partnership of Leading Futurists LLC and Futures at Work LLC. Leading Futurists LLC principals Jennifer Jarratt and John B. Mahaffie, foresight consultants since the mid-1980s, deliver to their clients research and analysis, futures exploration workshops, scenarios, keynote presentations, and writing/communications on the future. Each has taught foresight at the university level. They are experts on the future of work, worklife and the workforce, and have served HR clients in Federal agencies, states and municipalities, non-profits, and corporations. Futures at Work LLC principal, Dr. Katherine LY Green, has over three decades of HR experience as staff and consultant with the federal government, industry leaders, and HR professionals. She specializes in building the capacity of leaders and organizations. Her background includes training, consulting, teaching and research in HR/OD topics. She is certified in Strategic Workforce Planning, and uses foresight in succession planning, the aging workforce, change management and leadership. The two firms regularly collaborate to explore the future of work, the workforce, and work life, including recently a particular focus on the aging workforce. Examples of their work includes a 2015-2025 study for the State of Maine, Bureau of Human Resources, and workforce studies and research for the US Chamber of Commerce, AARP, government agencies, trade and professional associations. The three principals are all members of the Association of Professional Futurists (APF). The future of work is trendy, many people offer services and products with catchy titles and elaborate promises. We are different. Here is a downloadable version of this page: Workforce Futures Programs.